There appears to have been renewed interest in eyedropper fillers after World War II. Macniven & Cameron made one and so did Mabie Todd, and there may have been others. I vaguely remember that there was a Conway Stewart version and think there may have been a Burnham. There are various theories for the reappearance of these primitive filling systems. Some believe that it was because of a wartime shortage of rubber. That may well be so but it doesn’t explain their continued production long after the war. It seems likely that they were made primarily for export to tropical and equatorial countries where sacs perished quickly in the heat, and a small market was found for them here in Britain too. The Swan version was known as The Swan Safety Pen and went into production as early as 1942, and remained on sale until 1956. This is a later example in the torpedo shape, with no cap ring and and a black section. 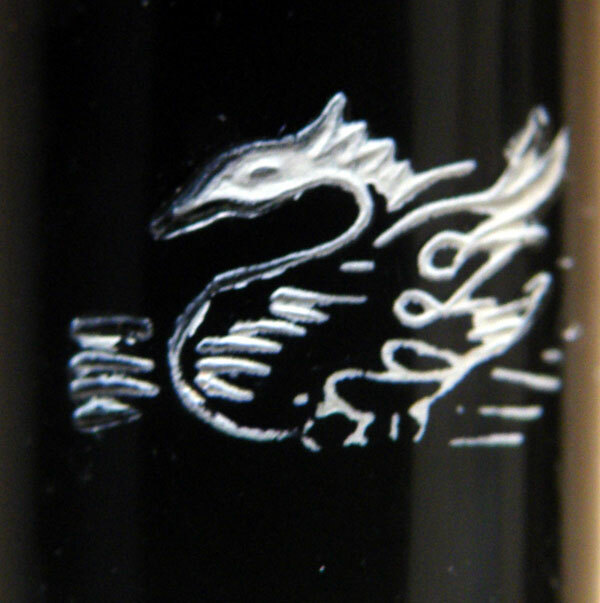 A Swan image is imprinted in white on the cap. It’s a bit more wild than the usual sedate Mabie Todd Swan – in fact it’s a little like a dragon! It works in the same way as a traditional eyedropper, but Swan have been quite bold with the design. The thread that seals the barrel full of ink is barely a third as long as a First World War eyedropper’s would have been, but to compensate those threads are extremely deeply cut. It works; the pen is completely ink-tight. All in all, though it’s an example of Swan’s last production, it’s a well-made pen. These pens are not common but they do turn up now and again. There’s more than a hint of End of Empire about them, and with hindsight we know that they represent the sad end of the great house of Mabie Todd Swan, too.